Now, what if this stranger tells you that they learned everything from your Twitter and Instagram account? Everything that they ever needed to know was right there for the picking. I don’t know about you, but that is a scary situation. This is something that we have to take seriously and think about before we post that picture or share that tweet. And believe me, I get it. We’re bloggers. We do write about our personal lives to connect with one another. We want to appear relatable and personable to our readers out there–to other bloggers out there. We want others to see that they are not alone in their journey of life, no matter where they are. But there is a line that we have to try not to cross. Everything that we say online is public and it’s written in ink. Deep down, we’re concerned about the privacy of our children, or what we write about our significant other. After all, anything and everything we do is traceable back to our real lives off the internet. 1. Not sharing your family’s real names. Those of us who respect this decision will not post their real name online either. Instead use a nickname, or better yet, an online name that you know your kids would never respond to. Of course let’s keep it pleasant 🙂 We don’t want a funny nickname to haunt this child when [or if] they ever come into social media. 2. We can filter our images with Instagram, we should filter what we say about our spouses. Remember that advice we received when we were newlyweds: keep disputes to yourself and not share it with your family. When the argument is over, you forget about the problem but our families will still think about–sometimes unable to let it go. Now let’s take this one step further. What if it was a poor decision your spouse (or you) made that had a bad result, and you shared it. How does that show their judgment (or yours)? Extreme yes, but we don’t know who is really reading our blog or really following us on social media. One incident should not decide if that person is good decision maker, but what if your boss, or your spouse’s boss followed you (because, they heard you had a blog), and read that? Do you think that will affect your spouse’s chance at promotion? What about your chances? 3. Being careful about posting vacations or when you’re out-of-town. If you are going on vacation and you want to share about your trip with others, that’s awesome. But try not to share when you’re going out-of-town. Don’t let everyone know that you’ll be out of your home for two weeks traveling X road, and staying at XYZ Inn. If anything, share your trip with us when you come back. You know how your phone wants to keep track of your location for everything that you do, umm…yeah…:turn it off. You would be surprised how much data is stored in a picture. Especially a picture that is taken with an app that has tracking enabled. That means if all your business is conducted within a 5 mile radius of your house (or mainly from your home) then it can and will be found out. You can still share your pictures, but do it wisely. 5. Stop before we post-what could sound cute now, could look real bad later. Pressing send is sometimes a spontaneous action. We are either heated about something, or excited and we want to share that experience immediately. But we should stop and think about what we’re posting before we do. Will that comment come back and haunt us down the line? These days, we sometimes feel like everyone is doing it, so it’s okay. To not do it seems not personable–that’s the last thing anyone wants to be. But we cannot let the trend of over sharing define how we protect our privacy. In our person-to-person interactions, we know when we crossed that imaginary line; we can see it through raised eyebrows or a look of shock on the other person’s face. In social media, we don’t have those clues. Since we’re operating without clues, we get the impression that it’s okay to let it all hang out. Nothing is try stopping us. 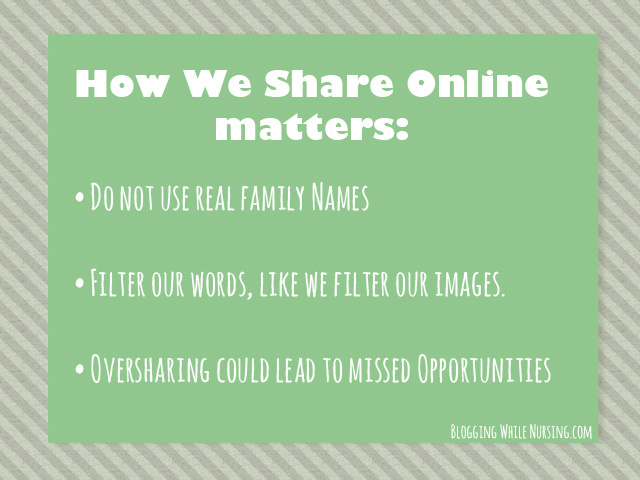 In person, we know when we crossed that line of over sharing but not in social media. Our privacy really matters, even more so now in a world that is connected online. Still not sure, how about this experiment? What are other ways you can think of to protect your privacy in an over sharing society? Do you think that privacy is over rated? 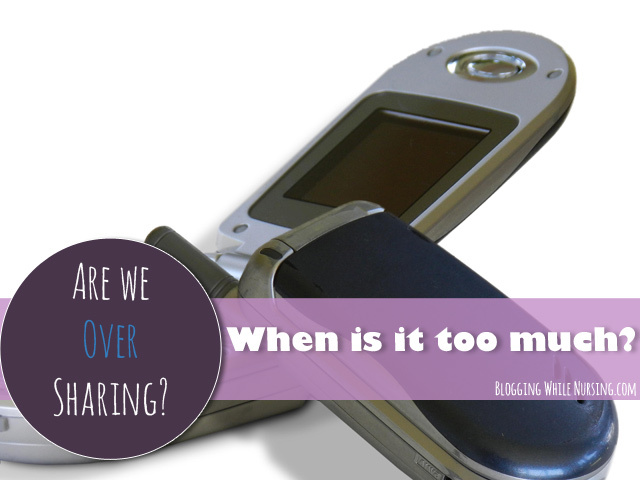 38 Comments on "Are We Over Sharing?" Fabulous tips Kalley! I share a bit too much on my blog, however, I don’t use real names nor announce when I’m out of town. I do the same on any public site as well. Just too scary, right? Great post and will be passing it along! Thank you Bren. You’re right, it is just scary how much of our info slips between our fingers. I guess for most of us, we have to determine, where our comfort level is and work within those lines. Love this. I do not use my kids real names and if someone does I erase the post immediately. I also hate that foursquare app I know you want to get extra stuff but people now know where you are I think that is one app that is a no no. I am very careful what I show online because people will come up to you based on a pic or a post. I hear you. I’ve been torn between sharing my family online, and keeping things private. I am at this point where I’m okay with my family being private. The sad thing is people will judge us based on what we post. I know we’re all trying to make sure there is no room for misinterpretation. As for foursquare, I don’t even have it on my phone, I really don’t see the point in checking into places. I’m just “old” in that regards hahaha. Oh my goodness LaShawn, that IS a scary experience! I feel you on family posts and things like that. I used to get very personal on this blog about things like that, but I just stopped because, (like you said) I need to just talk to them instead of writing it here. I think that’s an excellent point you made about the foursquare app – post when you are about to leave, and don’t check in a school or some place that is very personal. And you are so right, we are all over sharing! I think there is pure freedom in being anonymous on the web! It gives you a chance to be vulnerable without being judged. It is a freedom that has to be protected, because people really would love to take that away from others. What a timely post. This is the main reason why I quit. I shared enough. Everyone knows my child’s name but they don’t know my husbands, what he does or what town we live and stuff. It’s hard to suddenly become private when you are known for being open. I never expected the blog to become popular, but it did and I learned my lesson. I’m so sad to see you quit blogging, but I totally understand your reasons. The push to become more private when we’ve been so public is an interesting one. Almost as if we’ve had enough exposure, and now we have to get back to the things that matter most. Rachel, that’s a sold plan that you have in tact! I think everything that you have done so far is awesome and you’ve protected your personal life very well! Also, with the tracking features, it’s crazy how they ingrained it into so many applications on mobile devices. I’ve been on the fence about this issue. On one hand, yes, I do think we need to be careful and make smart decisions about what we choose to share on social media. On the other, I worry we’ve become too paranoid for our own good. Information is going to get out there one way or another despite our best efforts to keep it to ourselves. Obviously not everything or every personal detail in our lives, but enough that people can get a general idea of who we are and where we live. Tricky issue but one definitely worth discussing. Hi Kim and welcome! I do agree with you about our information getting out there-one way or another. I also do believe that we shouldn’t make it easy for that to happen as well. I think it comes back down to balance and what we are okay that’s floating out there. I do, however, wonder about how we create our online selves, and how true is it to offline selves. I really struggle with this topic b/c my blog didn’t/doesn’t have much to do with my daily life, but I found people responded much better when it was personal in some way. And, my blog’s instagram feed has morphed into much more of my personal feed. I finally just made it private because I wanted to have control over who saw my kids. Thanks for writing about this as we all need to find the balance and right way for ourselves. This is something I must take a real hard look at Kalley. Just today I told my wife Im about to step my game up on the blogging by getting more personal. Then I gave her an example of what I wanted to write about but she vetoed it. I’m going to have to be more creative in my writing because I want my readers to be able to relate. Thanks! Hi Vernon and welcome to the discussion! Being relatable by getting personal is a step that we all have to seriously think about. You know what they say, once it’s out there–it’s out there. There are no take backs. I think it’s great that you discussed it with your wife to see her comfort level with the material you were going to share. With that you are off to a good start. My rule of thumb is: if it makes me uncomfortable to mention then it shouldn’t be online. Kalley, finding the balance between relatable and too personal can be a fine line in this online world. Yet it something all of us should be taking more and more seriously. You provided such great practical tips. You are so right right Wanda, it’s like a fine line that we should be able to see, but sometimes we miss all together. It all comes back down to our comfort level. This is such a great topic, Kalley! I will definitely be more cautious of the things I share online after reading your post.